IndieLisboa is about to begin and it’s time to celebrate the eleven days of festival that are approaching. 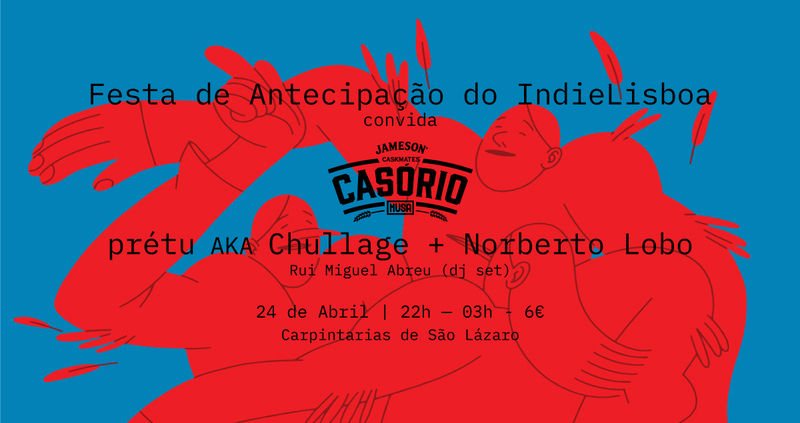 After having Conan Osiris do the honours one year ago, the IndieLisboa 2019 anticipation party invites you to a mashup concert with two big names of the Portuguese musical scene: Norberto Lobo and prétu AKA Chullage. On April 24th, at Carpintarias de São Lázaro, IndieLisboa joins the wedding between Jameson Caskmates & Musa. In this meeting, they join the talents of one of the most interesting guitarists of today and one of the most respected voices of national hip hop. A night in which music ties the knot and gives birth to an unrepeatable experience through the union between rap and folk music. Regarded as one of the most singular figures of the national music industry of the present time, there seems to be no limits to the territory that the music of Norberto Lobo manages to tread. An independent, empirical and restless artist, he has released seven of the most acclaimed albums of the last years. Estrela, released in spring of 2018, offers us an entrance to the aesthetic disquietude and the musical language that he has been developing. In one of his most recent collaborative projects, he joined Marco Franco and Bruno Pernadas to create Montanhas Azuis, reaping critical and public praise. Known for his social and political consciousness, prétu AKA Chullage is one of the strongest names in national hip hop. Author of hymns like “Rhymeshit Que Abala” and “National Ghettographik”, his latest album Rapressão dates back to 2012. His charisma, sharp words and songs of protest and urgency make him one of the greatest and most important Portuguese rappers in activity. The godfather of this marriage will be Rui Miguel Abreu, who will be in charge of the dance floor after the concerts. Writer, collector and music critic, he is one of the greatest connoisseurs and promoters of rap and hip hop in Portugal. He was the originator of programs such as “Nação Hip-Hop” and “Ginga Beat” and currently directs the Antena 3 program “Rimas e Batidas” and the website with that same name. Tickets for the party that anticipates the start of IndieLisboa can be purchased on the Ticketline website and on the day of the event at the venue for 6€. Doors open at 22h, performances start at 22h30.